...Accompanied by the audiobook cover, because I cannot in all conscience expose anybody else to that paperback cover. Even Lovecraft can't do that justice. So, anyway - the third novel in my Vorkosigan review-through, Cetaganda is where Bujold begins to show her genre-bending propensities. 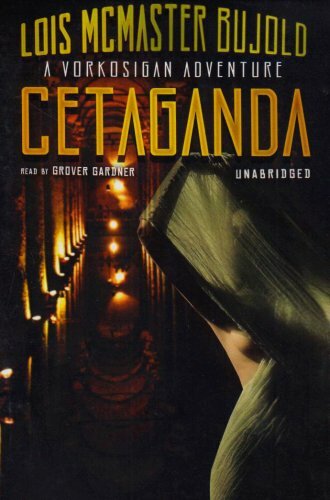 While its two (Miles-related) predecessors could easily have been classed as military space opera with a twist, Cetaganda is a mystery with the trappings of space opera. Well- I say a mystery: if anything, crime novel describes it better - because this is firmly Miles' story, and both he and the reader are let in on what's truly happening rather late. But with Bujold, subgenre rarely means anything, so the best description is the novel's most dominant feature: Miles. If you've read my previous Bujold reviews, you'll know that Miles is - in my opinion - one of the most unique, and certainly the best cliche-busting character of SFF. Disabled, manic-depressive, and an occasional genius with more than one large flaw - including a tendancy to plan relationships in rather military terms, but we'll get to that much later. He's wry, witty, and the driver behind this profoundly character driven novel. Miles has encountered mercenaries, conspiracies and invasions before - but now he's faced with a new challenge. Diplomacy. Attached to the Barrayaran Ambassador on Eta Ceta, homeworld of their ancestral enemies, the Cetagandans, the visit rapidly begins to go awry: a murder attempt upon docking, a servitor's suicide, and the disappearance of an important Cetagandan device all incite Miles' interest. He's not dragged into the investigation, he jumps! ...And in a genre of reluctant heroes, it's nice to have one that gets out of his depth so readily. Of course, there's another reason: Miles' growing infatuation with one of the Cetagandan haut, the genetically engineered upper caste. Foiling plots for who are - technically - the enemy, trying to avoid some exceedingly artistic murder attempts, and attempting to keep Ivan at his side... Miles is quickly juggling both schemes and responsibilities. And when Miles is under pressure, it's a treat for the reader, because it's only then that his characteristic clever (and frequently entertaining) solutions come into play. The weakest element of Cetaganda is definitely, for me, the romantic involvement between Miles and Rian - who, while interesting, is difficult to see as interesting Miles. It seems to be little more than physical, and while Miles acting the idiot seems to be partially the point, for me, that came off as a little shallow. Fortunately, the rest of the novel more than makes up for it. I've mentioned Bujold's strength at character development, and this shows: Miles and Ivan, his cousin, are as enteratining as ever. Ivan in particular gets a far larger part than previous novels, and plays it to the full - lazy, likeable, and attempting to keep his cousin grounded in someone's version of reality. Ivan plays the straight man (to an extent! ), and he's good at it. Though the mystery itself exists more as playground than focus, it's engaging - especially when viewed through the distorted lens of events. However, the embassy scenes are, too, from amateur attempts to ebarass the Barrayarans to the genuine trouble Miles liberally coats himself with. Simply put, Cetaganda manages to keep the fun factor throughout. A rare achievement. Written with Miles' customary self-deprecating narration, Cetaganda marks the first major genre shift of the Vorkosigan Saga - showing this to be a series which not only manages a range of tones, but of content as well. This is truly a sequence it's hard to get bored with, and while Cetaganda has its weaker elements - the love interest, Rian - its events are fascinating, and represent a period that not only is interesting in the present, but provides a key continuity point and reference later in the series. If you've read The Warrior's Apprentice and The Vor Game, continue to Cetaganda - you won't regret it. The Vorkosigan adventures by Bujold have always been ranked highly for me. Always worth a re-read. Yes, for me also. There's also a new novel due out around November this year, from Ivan's POV: Captain Vorpatril's Alliance, according to Bujold's blog! Pretty exciting.